A freed Al Jazeera English reporter and his family have called on Egypt to release his two colleagues who remain behind bars, in a case widely condemned as a sham by human rights groups. Australian Peter Greste, a former BBC journalist, was whisked away on a flight to Cyprus, in a welcome surprise to colleagues and activists who spent months pressing for his freedom. But rights groups and Greste's Qatar-based employer called on Egypt to release the other two defendants in the case, which has hindered the country's international standing as it struggles to recover from the political unrest and economic collapse caused by the 2011 uprising. Greste, Egyptian-Canadian Mohamed Fahmy and Egyptian Baher Mohamed (pictured above, Reuters) were arrested in December 2013 over their coverage of the violent crackdown on Islamist protests following the military overthrow of then president Mohammed Morsi. Egyptian authorities accused them of providing a platform for Morsi's Muslim Brotherhood, now declared a terrorist organisation, but authorities provided no concrete evidence. The journalists and their supporters insist they were doing their jobs during a time of violent upheaval. The three were widely seen as having been caught up in a regional power struggle between Egypt and Qatar, which funds Al Jazeera and had been a strong backer of Morsi. Greste's release follows a thawing of ties between Cairo and Doha. Greste was in a state of disbelief about his freedom and deeply relieved – but still worried about his imprisoned friends, said his brother Andrew. "His excitement is tempered and restrained and will be until those guys are free," Andrew Greste said in Brisbane, Australia. 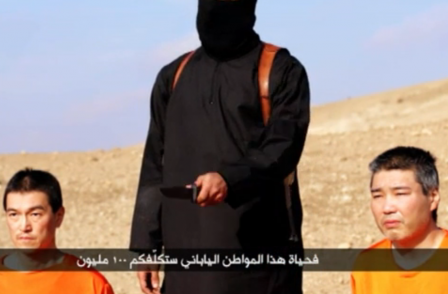 "He won't give up until Baher and Mohamed are out of there." Australian foreign minister Julie Bishop, who had been negotiating for Greste's release, said the 49-year-old journalist had told her by telephone from Egypt that he was desperate to return to his family in Brisbane after spending 400 days in custody. "He was immensely relieved and he was desperate to come home to Australia and reunite with his family," she said. "From my discussion with him, he was very keen to be back on a beach and lying in the sun in Australia." Greste had been given short notice that he was being released "unconditionally", Bishop said, adding: "We moved as fast as we could to make arrangements for his immediate departure." Communications minister Malcolm Turnbull credited the international pressure on Egypt as well as the personal lobbying of Australian prime minister Tony Abbott for the outcome. "It was a political decision to imprison him in the first place and a political decision to release him," Turnbull said. "Clearly a lot of international influence and persuasion has been brought to bear, not just the Australian government." Egyptian officials said Greste was released following a presidential "approval" under a new deportation law passed last year, which appeared to have been tailored to the Al-Jazeera case. Acting Al Jazeera director General Mostefa Souag said the Qatar-based network "will not rest until Baher and Mohamed also regain their freedom". Hassiba Hadj Sahraoui, Amnesty International's deputy director for the Middle East and North Africa, welcomed the news of Greste's release but said "nothing can make up for his ordeal" and called for the others to be released. "It is vital that in the celebratory fanfare surrounding his deportation the world does not forget the continuing ordeal" of his co-workers, she said. 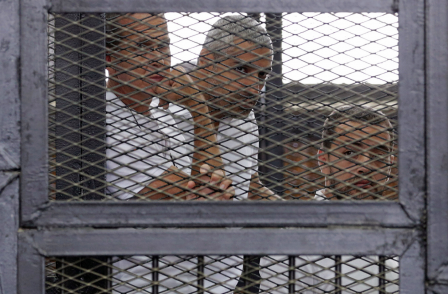 Canada also welcomed the "positive developments," saying it was hopeful that Fahmy's case would be "resolved shortly". The three were convicted on terrorism charges and for spreading false information, faking reports to show that the country was on the verge of civil war and aiding the Brotherhood's goal of portraying Egypt as a failed state. Mohamed received an additional three years for his possession of a spent bullet he had picked up as a souvenir. Three other foreign reporters received ten-year sentences in absentia. Twelve other co-defendants were sentenced to between seven and 10 years, some of them in absentia. An appeals court overturned their verdict in January and ordered a retrial. No date has been set for the case. During the five-month trial, prosecutors presented no evidence backing the charges, at times citing random video footage found with the defendants that even the judge dismissed as irrelevant. The Al Jazeera journalists' arrest was part of a broad crackdown against Islamists in which hundreds have been killed and thousands arrested following the ousting of Morsi. Many of the leading activists behind the 2011 uprising that brought down President Hosni Mubarak have also been jailed for breaking a law banning unauthorised protests. According to a law passed late last year, President Abdel-Fattah el-Sissi – who as military chief overthrew Morsi amid popular protests against the Islamist leader's year-long rule – has the power to deport foreign defendants or convicts if it is considered to be in the interest of national security. The law was seen as providing a potential legal instrument with which to free the journalists. El-Sissi had repeatedly said he wants to end the case, which has prompted a storm of international criticism.